I witnessed stocked trout fishing with curiosity, never participating. This isn’t “A River Runs Through It”, or “On Golden Pond”. It could be “Grumpy Old Men”, but the water isn’t frozen. West Virginia grows trout and stocks nearly a million fish a year for anglers to catch. Put and take fishing, where the state puts and anglers take fish home, just cuts out the fish market middleman. That’s like a safari at the zoo, or finding a date at an all girls school, or seeing a plaid suit at a used car lot. This concept was lost on me. In March, my buddy George Barr invited me to go trout fishing. A 15-minute hike through the woods in the dark at 05:30 in 34 degree weather, hauling two rods each, tackle, and the wishful-thinking cooler, terminated at a mountain lake shoreline. Headlamps lit the way. I thought we were alone until my sleep deprived eyes focused. Lights lined the shoreline like a mid winter holiday festival. Trout fishing is a big deal. Normally I fish from my Skeeter’s padded carpeted deck. I now stood on dirt, in the dark, making casts in the lake’s direction. 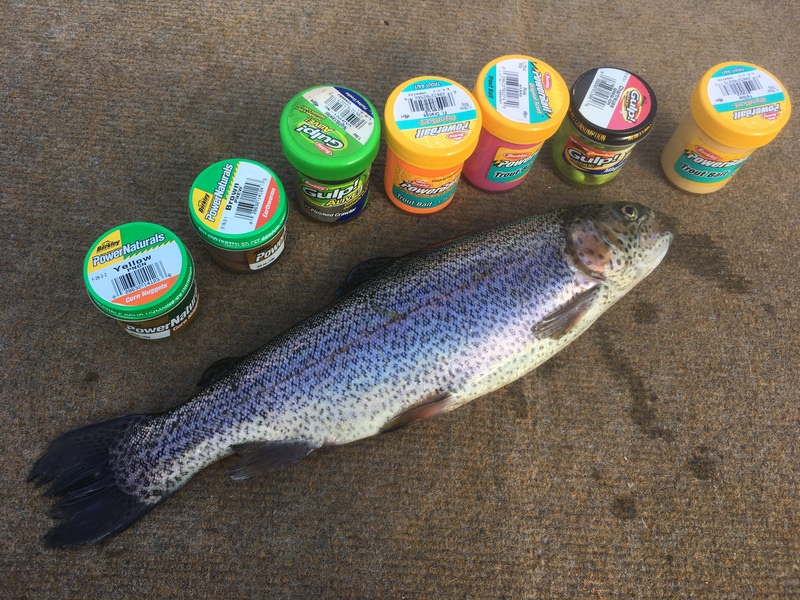 I relied on George and brought jars of bright orange floating Power Bait, size 12 Mustad red treble hooks, and 4 pound test Gamma Edge Fluorocarbon to tie to 8-pound Torque braid. George said trout feed up. Power Bait balls around a hook float about 2-3 feet off the bottom. I tried a drop shot and George fished the traditional way, a slip sinker and leader. We caught a few but no limit, the standard 6 fish trout angler goal. You can use two poles. Trout are sight feeders. Heavy rain and wind in April and May muddied the water, but I decided to go solo and try trout fishing, with bass as a back up. Hiking wasn’t for me. Time to take my jon boat. No trout, but I did meet Bill and Cheryl and we chatted. Understanding these fish are raised in clear water and are fed food pellets, bright colors are key. Power Baits suspend where trout can find them. But what color? Florescent orange, chartreuse and pink are standards. I got them and the combination of all three. But, according the bank brigade, sometimes you need to wrap dough around a Power Bait earthworm. I also picked up Power Bait corn, maggots, mealworms and many more. Something had to work. After chatting with Bill and Cheryl, I went to a light Carolina rig, with the same line and a rod with a bobber to suspend a bait. I ran into Bill and Cheryl again. When I launched my boat, I decided there weren’t going to be any trout opportunities. Too muddy. They caught one and said they’d been getting bites. I decided to dig in and do the trout thing. Within chatting distance in a hot spot, I set out both rigs and caught two on the floating Power Bait bottom rig. Keeping fish isn’t something I do and one or two fish wasn’t going to cut it. Coming up short of a limit would mean I’d give my fish away. Fish number three came on board in short order. I was really focused on the bottom rig, but kept the bobber floating around. The wind was blowing and gusting. My 4th fish gave me hope I’d achieve the elusive trout limit. This is a game of patience and focus. Under windy conditions, the bobber was ineffective. Fish number five arrived. The goal was within reach. Bill and Cheryl were leaving and encouraged me to stay. It’s like bass tournament fishing, within one of a limit and the clock’s running out. Put the trolling motor on high to cover water for that last fish. Not with trout. Anchored in one spot, nothing could ratchet up the fishing pace, except to abandon the bobber. What took me so long!? It wasn’t long before number six was tugging. Reaching the limit means fishing is over. No more casting, baiting hooks and intense focus. Time to get home to clean fish, which I hadn’t done in over 50 years. Luckily Bill had also talked me through that. Not even close to being an expert, I filleted the fish and my wife prepared. Not particularly fond of fish, except Mrs. Paul’s, Gorton’s, or Arthur Treacher’s, this trout wasn’t too fishy. It tasted of victory. More grass and hot water makes it time for frog fishing. Mann’s Super Frogs are great when tied to GAMMA 50 pound test Torque braid. Use a long rod and set the hook hard! Over sparse grass or at high tide, try Lucky Craft Gunfish walkers and G-Splash poppers, perfect for clear and calm water with overcast skies! Walk the dog with the Gunfish. Don’t stop when fish strike! They’ll come back. For poppers, pop and stop, varying retrieves until a cadence produces. Also try Mann’s Waker over cover. Use follow-up Mann’s 5-inch HardNose Freefall weightless stickworms on 20-pound test GAMMA torque braid for missed bites! A steady dose of shallow diving Mann’s Baby 1-Minus crankbaits, in craw and baitfish patterns, work over wood and grass. Mann’s Reel N’ Shad is deadly this time of year. For line, 12-14 pound test Edge on a KVD Quantum cranking rod. Also use craw-patterned chatterbaits with a Mann’s HardNose Mullet for a trailer. Pitch Mizmo tubes on 3/0 Mustad Tube hooks with ¼ ounce weights on 14-pound Edge to docks and wood at higher tides, and then grass during every tidal phase. Find targets with Maui Jim HT lenses. Use garlic Jack’s Juice Bait Spray scent. Also try swimming jigs like Mann’s Stone Jigs with a HardNose Reel ‘N’ Shad around cover. Beef up tackle for this. Author Capt. Steve Chaconas is Potomac bass fishing guide & contributing writer for BoatU.S. (BoatUS.com) Potomac River reports: nationalbass.com. Book trips/purchase gift certificates: info@NationalBass.com. « Is Your Portfolio as Efficient as It Could Be?